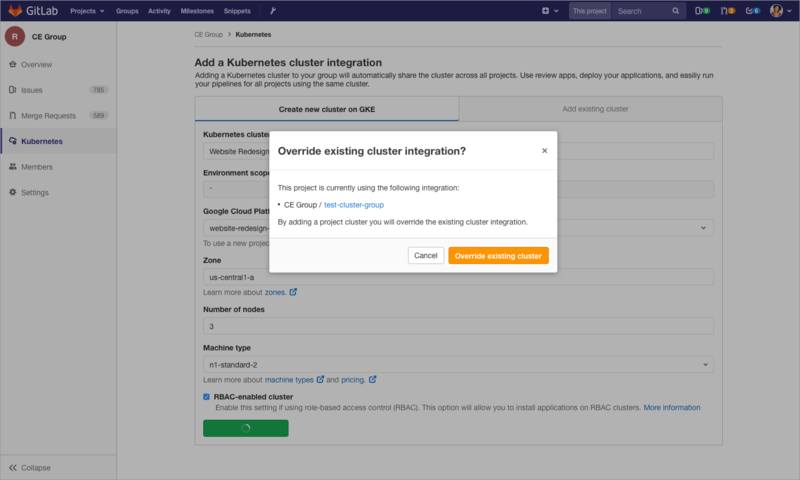 Currently, k8s clusters can only be configured at the project level. This can be limiting for teams that want to use the same cluster across all projects/department/company. A single cluster configuration that can be leveraged group-wide. Add a new option for "Operations" at the group level that will allow users to access a kubernetes menu item. Group-level cluster will follow the same licensing approach as project-level clusters: CE will allow for 1 cluster at the group level (or sub-group level) and EE will allow for multiple cluster configuration. For CE, having a cluster configured at the group level shall not affect the ability for related project to have project-level clusters setup, that is, if Group 1 has a cluster setup, project 1A can have a separate cluster setup (project 1A belonging to Group 1). Project-level cluster trumps group-level cluster, that is, if there's an env scope match, project level always wins. Sub-groups will determine which cluster to use by looking at closest ancestor with a matching env scope pattern. As an owner or maintainer, I should see a Kubernetes tab in my group sidebar. As an owner or maintainer, I should see an empty state with a call to action when I have no group clusters. As an owner or maintainer, I can set the environment scope when creating my group cluster. As an owner or maintainer, I cannot set the environment scope when creating my group cluster. The environment scope is *. As an owner or maintainer, I am able to install Helm Tiller and Ingress on my group level cluster. Note: The only difference between EE/CE mockups would be the ability to set an environment. As an owner or maintainer, I am able to set a domain for both my group and project level clusters. I am able to set my domain regardless of whether I have installed Helm Tiller and/or Ingress. As an owner or maintainer, I am able to add multiple group clusters to each group or subgroup. As an owner or maintainer, I can only add one group cluster to each group or subgroup. Group level clusters will be automatically added to projects within that group. As a user who created a new group cluster, I will be warned if my cluster won't be active for any given project. As an owner or maintainer, I can have multiple active cluster integrations at various levels on my project. As an owner or maintainer, I can only have one active cluster integration on my project. As an owner or maintainer, I have the ability to add one project level cluster even if there are group clusters. This will override my group level integration for this project. As an owner or maintainer, I can view a group cluster on my project. The cluster links to the group cluster page, and I must make any edits there. As an owner or maintainer, I cannot remove a group level cluster from a specific project. I can only override the cluster with a project cluster. ### Problem to solve Currently, k8s clusters can only be configured at the project level. This can be limiting for teams that want to use the same cluster across all projects/department/company. ### Further details A single cluster configuration that can be leveraged group-wide. ### Proposal Add a new option for "Operations" at the group level that will allow users to access a kubernetes menu item. The following have been discovered as part of https://gitlab.com/gitlab-org/gitlab-ee/issues/7412: 1. Only the following group-level applications will be available for MVC: * Tiller * Ingress 2. The following applications will be available post-mvc: * Runner https://gitlab.com/gitlab-org/gitlab-ce/issues/51988 * Prometheus https://gitlab.com/gitlab-org/gitlab-ce/issues/51963 * JupyterHub https://gitlab.com/gitlab-org/gitlab-ce/issues/51989 3. Group-level cluster will follow the same licensing approach as project-level clusters: CE will allow for 1 cluster at the group level (or sub-group level) and EE will allow for multiple cluster configuration. 4. For CE, having a cluster configured at the group level shall not affect the ability for related project to have project-level clusters setup, that is, if Group 1 has a cluster setup, project 1A can have a separate cluster setup (project 1A belonging to Group 1). 5. Adding a group-level cluster will automatically show that cluster to all children projects 7. Environment scope for CE will enforce `*` just as CE project-level cluster configuration does 8. Project-level cluster trumps group-level cluster, that is, if there's an env scope match, project level always wins. 9. Sub-groups will determine which cluster to use by looking at closest ancestor with a matching env scope pattern. 10. Namespace: 1. Remove the project namespace from group-level clusters completely 1. Don’t show it in the list when listing clusters, either at the group or project level 1. Don’t have the field when creating a group-level cluster 1. Don’t have it when editing a group-level cluster 1. But keep it when creating/editing a project-level cluster as there’s still reason to keep it 1. Even though project-level clusters could have custom project namespaces, don't show them in the list of clusters for consistency 1. The backend still needs to provide `KUBE_NAMESPACE` to CI/CD pipelines for group-level clusters. I suggest keeping the `$PIPELINE_NAME-$PIPELINE_ID` format 11. Managing the cluster can only be done by group maintainers/owners 12. 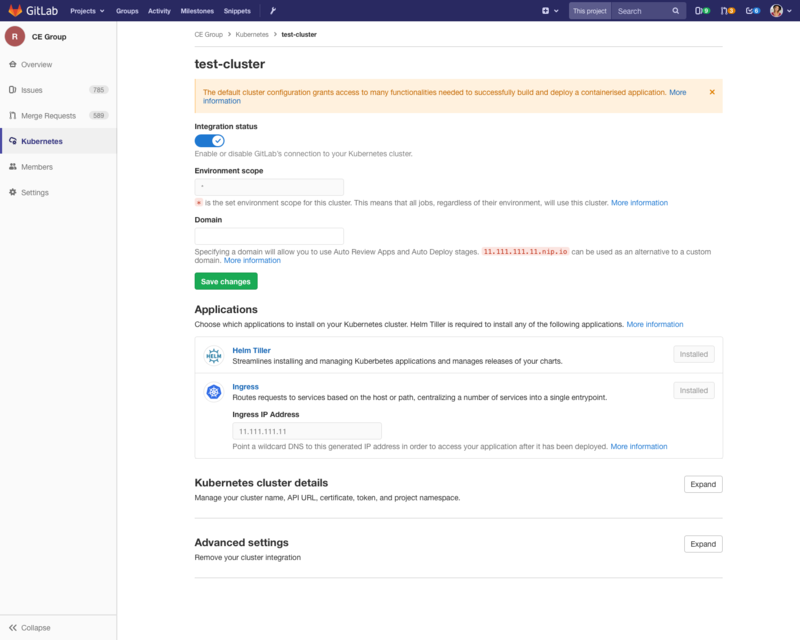 Removing cluster at the group level will disable the access for its children projects Discovery issue https://gitlab.com/gitlab-org/gitlab-ee/issues/7412 ### Follow-up issues: * Auto DevOps domain will be moved away from project configuration to cluster configuration, to be shown (possibly) along ingress information https://gitlab.com/gitlab-org/gitlab-ce/issues/52363 * Support installing GitLab runner on group level cluster https://gitlab.com/gitlab-org/gitlab-ce/issues/51988 * Show errors if project namespace/SA is missing https://gitlab.com/gitlab-org/gitlab-ce/issues/54506 ## User stories and mockups ### Sidebar and empty state |EE/CE| |--| |As an owner or maintainer, I should see a `Kubernetes` tab in my group sidebar.| |As an owner or maintainer, I should see an empty state with a call to action when I have no group clusters.| |! [group__operations--kubernetes-empty-state](https://gitlab.com/gitlab-org/gitlab-ee/uploads/df68d89c79ba537eb582a5135808a7d6/group__operations--kubernetes-empty-state.png)| ### Environment scope |EE|CE| |--|--| |As an owner or maintainer, I can set the environment scope when creating my group cluster.|As an owner or maintainer, I cannot set the environment scope when creating my group cluster. The environment scope is `*`.| |![EE-group__operations--kubernetes-create](https://gitlab.com/gitlab-org/gitlab-ee/uploads/6d78f340fcdc3d8d8a4038f90477e083/EE-group__operations--kubernetes-create.png)|! 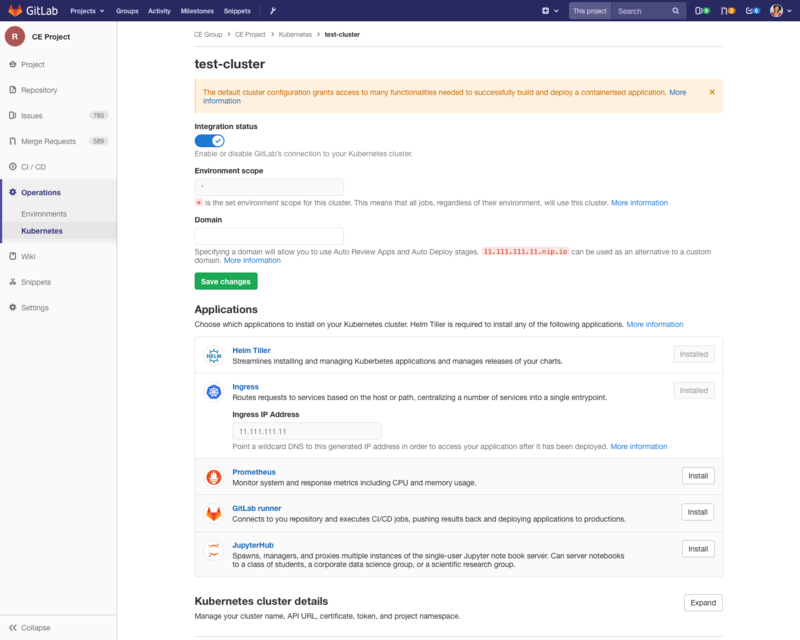 [CE-group__operations--kubernetes-create](https://gitlab.com/gitlab-org/gitlab-ee/uploads/e0c09aeac3694bc1414990be9f1b6b85/CE-group__operations--kubernetes-create.png)| ### Applications and domain |EE/CE| |--| |As an owner or maintainer, I am able to install Helm Tiller and Ingress on my group level cluster. **Note:** The only difference between EE/CE mockups would be the ability to set an environment.| |As an owner or maintainer, I am able to set a domain for both my group and project level clusters. I am able to set my domain regardless of whether I have installed Helm Tiller and/or Ingress.| |Group|Project| |--|--| |![CE-group__operations--kubernetes-domain-applications-installed](https://gitlab.com/gitlab-org/gitlab-ee/uploads/471d55280d44b92cc21e557ac33e9123/CE-group__operations--kubernetes-domain-applications-installed.png)|! 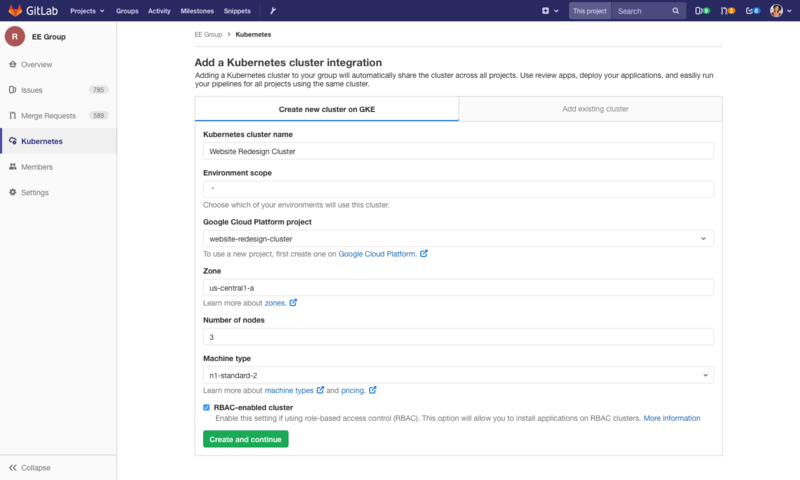 [CE-project__operations--kubernetes-domain-applications-installed](https://gitlab.com/gitlab-org/gitlab-ee/uploads/3b42c33b20e10fdc10dd82ff6c1b6b83/CE-project__operations--kubernetes-domain-applications-installed.png)| **Improvements:** Alternative issues will be made for installing GitLab Runner, Prometheus, and Jupyterhub https://gitlab.com/groups/gitlab-org/-/epics/114 ### Group clusters |EE|CE| |--|--| |As an owner or maintainer, I am able to add multiple group clusters to each group or subgroup.|As an owner or maintainer, I can only add one group cluster to each group or subgroup.| |! [EE-group__operations--kubernetes-one-project](/uploads/a6ae702aeeccd313c56cf72fa158a211/EE-group__operations--kubernetes-one-project.png) Add cluster button enabled|! [CE-group__operations--kubernetes-one-project](/uploads/570ffa177f93865ab54afcc2c28c0750/CE-group__operations--kubernetes-one-project.png) Add cluster button disabled| |EE/CE| |--| |Group level clusters will be automatically added to projects within that group.| ### Cluster Overrides |CE| |--| |As a user who created a new group cluster, I will be warned if my cluster won't be active for any given project.| |! [CE-group__operations--kubernetes-warning](https://gitlab.com/gitlab-org/gitlab-ee/uploads/18970bea64388f001fffd6f8e4a1c3ef/CE-group__operations--kubernetes-warning.png)| **Improvement:** Allow users to specify which projects they would like override. *Create new issue* |EE|CE| |--|--| |As an owner or maintainer, I can have multiple active cluster integrations at various levels on my project.|As an owner or maintainer, I can only have one active cluster integration on my project.| |![EE-project__operations--kubernetes-two](/uploads/33f5efb25c0e09274ec0f40929b62b90/EE-project__operations--kubernetes-two.png)|! [CE-project__operations--kubernetes-two](/uploads/19029015a473f0385815ca586e82f1de/CE-project__operations--kubernetes-two.png)| |![EE-project__operations--kubernetes-four-2](/uploads/00215a95df8f6898aa864c406b51b5e4/EE-project__operations--kubernetes-four-2.png)|! [CE-project__operations--kubernetes-four](/uploads/c8bf95c36c356d558c609dded79fd94b/CE-project__operations--kubernetes-four.png)| |EE| |--| |If multiple clusters exist at the same level, my environment will first look for an exact match, then a partial match, then `*`| |If there are multiple matches, my environment will choose the first match. Project -> Subgroup -> Group| |! [EE-project__operations--kubernetes-four-1](/uploads/dab69f2221bbbbb1bfcaa6af930aa978/EE-project__operations--kubernetes-four-1.png)| |If my environment has no match, it will continue up the chain to find a match. Project -> Subgroup -> Group| |CE| |--| As an owner or maintainer, I have the ability to add one project level cluster even if there are group clusters. This will override my group level integration for this project.| |! [CE-project__operations--kubernetes-one-group](/uploads/cb54982641bb36d0952fac2330b7ff80/CE-project__operations--kubernetes-one-group.png) Add cluster button enabled| |! [CE-project__operations--kubernetes-override-integration](https://gitlab.com/gitlab-org/gitlab-ee/uploads/d485a93a6208b024e95be33edd9b5ee6/CE-project__operations--kubernetes-override-integration.png)| **Possible improvement:** Explore always keeping the create button enabled. 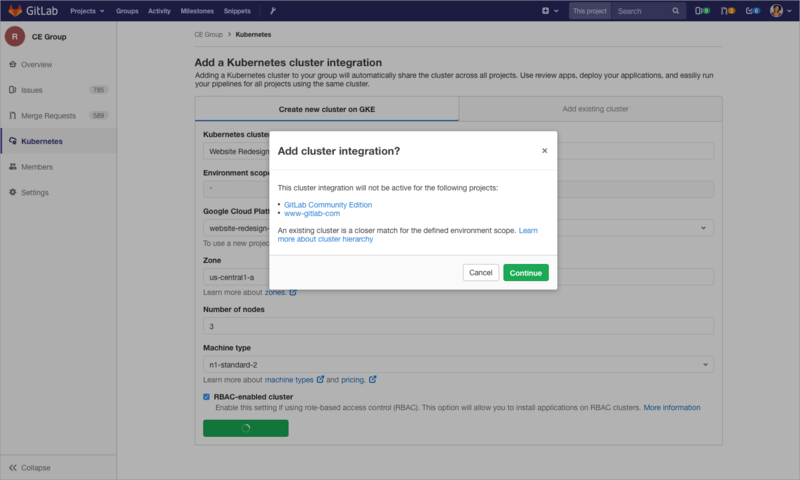 In CE, this would mean owners and maintainers can add as many integrations as they want, but they must select one: either a group or a project level cluster. This removes confusion over why the user cannot create another integration. *Create new issue* ### Editing group clusters |EE/CE| |--| |As an owner or maintainer, I can view a group cluster on my project. The cluster links to the group cluster page, and I must make any edits there.| |As an owner or maintainer, I cannot remove a group level cluster from a specific project. I can only override the cluster with a project cluster.| |! [CE-project__operations--kubernetes-one-group](/uploads/cb54982641bb36d0952fac2330b7ff80/CE-project__operations--kubernetes-one-group.png)| **Improvement:** Allow users to exclude a group level cluster from a specific project. *Create new issue* ### Auto DevOps project settings |EE/CE| |--| |As an owner or maintainer, I am no longer able to set a domain within my project Auto DevOps settings| |! [CE-project__settings--ci-cd-autodevops](https://gitlab.com/gitlab-org/gitlab-ee/uploads/957416e9f26b785f5cdd9082444e3ec9/CE-project__settings--ci-cd-autodevops.png)| ### What does success look like, and how can we measure that? User no longer copy/paste the same cluster configuration in multiple projects but rather use a group-level cluster ### Links / references /label ~"feature proposal"